Is that for the NetFlix series? Yes, that's the promo poster they put out for it. I started playing Castlevania Chronicles for the PSX and recently learned that you can press L1 + R1 after selecting Arrange Mode to change the soundtrack. Now I can listen to the original X68000 soundtrack while playing the superior PSX version! I read a rumor that Konami would be porting al their rebirth WiiWare games to the Switch. Don’t know how much stock you can take in the rumor but I personally find it hard to justify paying for any WiiWare game now that I know their will be no way to redownload after a year. I know that’s true of all digital and you keep it as long as your system doesn’t break and you don’t delete it, but I feel like I want at least a few years of insurance on my downloads in case of any sort of system failure. Of course, the flip side is some of these games won’t be purchasable in any form once the Wii shop closes and you’re taking a gamble on this showing up on Switch. I never got around to buying any of them but I would be interested in a castlevania if it came to Switch. I really enjoy both styles of Castlevania games, and rebirth was the first non Metroid style one in a long time. Having played (and enjoyed) Rondo of Blood is it still worth playing Castlevania: Dracula X on SNES? I know that many (most?) of the levels are simplified versions of the those found in Rondo of Blood, but I'm not sure how many unique elements are present. Is Dracula X different enough to warrant its own playthough or is it just a dumbed down oversimplification of Rondo of Blood? It's better than Haunted Castle. The game's only real problem is horrible level design and enemy placement. If you're a big Castlevania fan, I'd say it's worth playing. I think I like it more than Castlevania Chronicles. But yeah, the levels feel very sterile and uninspired. Enemy placement gets "cheap" at times. And all I have to say about the fight against Dracula is this: Pillars. It's still a fun game and better than CV1-2, Castlevania Legends or Castlevania Adventure for example. But the final boss is kinda cheap so be prepared for that. Thanks for the input guys! I'll probably get around to Dracula X at some point, although this might be an instance in which I deviate from playing the series in strict chronological order of release (not that I've been too strict about it with Castlevania in the first place). Being as the last Castlevania game I beat was Rondo of Blood, I don't want to go into Dracula X with such a strong (and recent) sense of deja vu. In many ways they're superior to their NES counterparts. The first one on the FDS is cool because it has the player entry screen which has an extra piece of music that is not present in the NES or FC cart versions. It saves your progress at each stage, which I guess is useful if you're a noob. It also throws your name in the credits which always makes me chuckle. I don't own a Famicom Disk System, but I play this version occasionally on a NES flash cart, or I have the RAM adapter and a FDSStick. http://www.castlevaniadungeon.net/games/cv2foreign.html wrote: The other major difference is the music...the game is no larger than 1 megabit, which is fairly small. 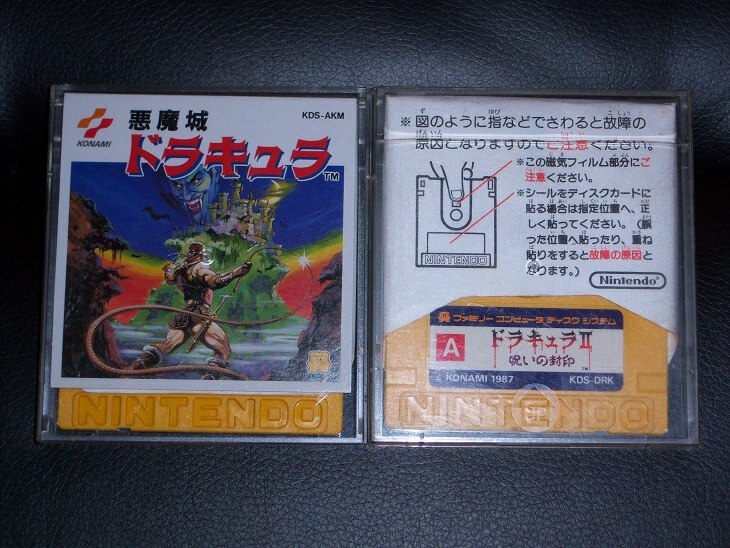 With the extra space granted by a cartridge, the programmers added extra musical effects to the American versions. If you listen closely to both of them, the USA version makes excellent use of the PCM drum channel, while the Japanese disk only uses the noise channel. The instruments have also changed as well. This is one of the few examples where the American version is actually superior. So I always felt like I would have to sacrifice better music for a convenience. I probably mentioned it a million times, but I still wanna get around to playing [quote=http://www.romhacking.net/hacks/1032/]this patch[/quote] that fixes all the annoyances with the game (re-translation, in-game map, SRAM save feature, etc).